Alpaca with a Twist. Weight: Worsted. Color #5012 Yellow Tweed with Nubs. "HIGHLANDER". Color: 5012 Light Yellow with slubs, Dye lot: 591. Gauge: 16 sts / 10 cm = 4". Gorgeous palette and so soft! The color blends are simply amazing. A single loose twist of soft acrylic and polyamide is flecked with slubs of flat knit fabric. Fiber Content: 50% Acrylic/ 50% Polyamide. 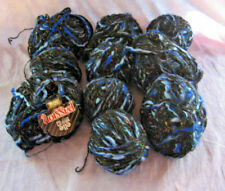 Here we have 10 Balls of Elle Nortex Passion yarn. This is a slub yarn with varying thicknesses. 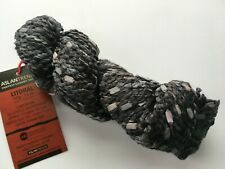 Lovely unique soft yarn. You are looking at a 6 Skein Lot of Spring Brook Yarns "Blossom" Worsted Weight Yarn in White & Pink (Nat Bubblegum). Grams Per Skein: 50. Hand wash/lay flat to dry. Fiber Content: 74% Acrylic; 22% Cotton; 4% Polyester. 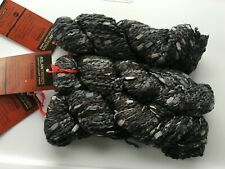 You are looking at a 5 Skein Lot of Spring Brook Yarns "Blossom" Worsted Weight Yarn in White & Black. Grams Per Skein: 50. Hand wash/lay flat to dry. Fiber Content: 74% Acrylic; 22% Cotton; 4% Polyester.